The absence of some of the bigger Show Gardens at the 2017 RHS Chelsea Flower Show in some respects has added to the strength of the smaller garden categories this year, writes Sandy Felton. 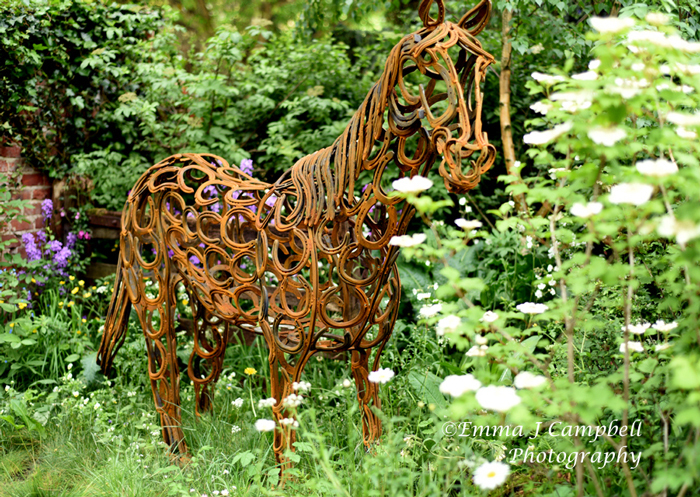 Always highly popular with show visitors, the Artisan Gardens category attracted increased popularity with nine entries and the five entries in The Fresh Gardens are varied and innovative. 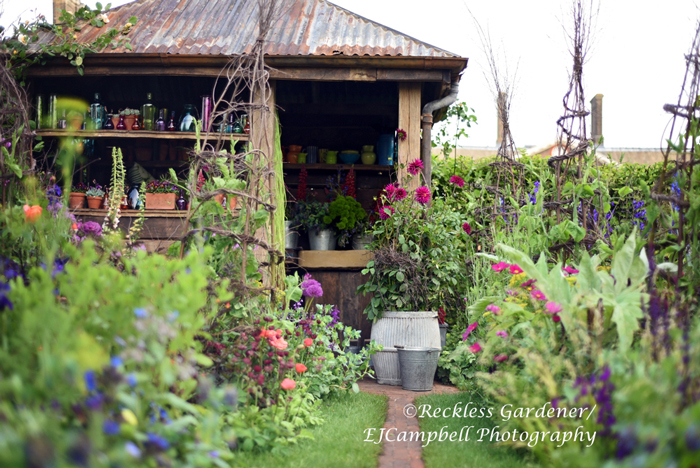 The Feel Good Gardens, are a particularly brilliant innovation – in fact a masterstroke -and it is to be hoped that the Royal Horticultural Society (RHS) will consider this category again for next year. 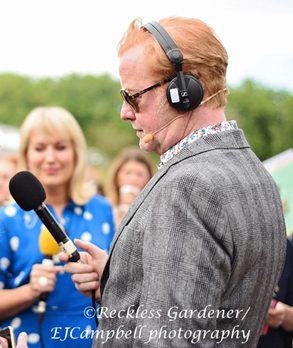 Celebrating the 50th anniversary of BBC Radio 2 with five gardens each designed by a different designer paired with a BBC Radio 2 celebrity, the variety of themes and planting is jaw dropping. These gardens are not for judging but I have a sneaky feeling that if in the future the RHS decide to make it a permanent category it would attract designers. 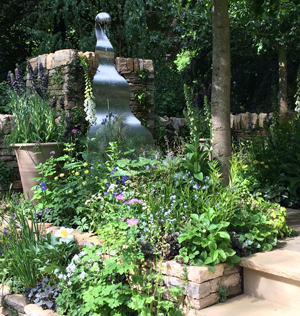 A personal fave was Fiona Cadwallader’s ‘The Poetry Lover’s Garden‘ (Silver) (left) again with delightful planting. A tranquil space to sit and read by the sound of water running down a striking water feature. Also liked the fact this garden could be viewed from two sides giving a totally different perspective.The garden is based on This Lime Tree Bower My Prison by Samuel Taylor Coleridge and Fiona carefully referenced the poem with her planting. The ‘IBTC Lowestoft: Broadland Boatbuilder’s Garden’ (pictured banner above) designed by Gary Breeze (Gold) is perfectly balanced, not just for the planting and sense of peace but also for the skillfully built oak boat sitting on its small jetty surrounded by plants and trees native to the dykes that criss-cross the Norfolk Broads. 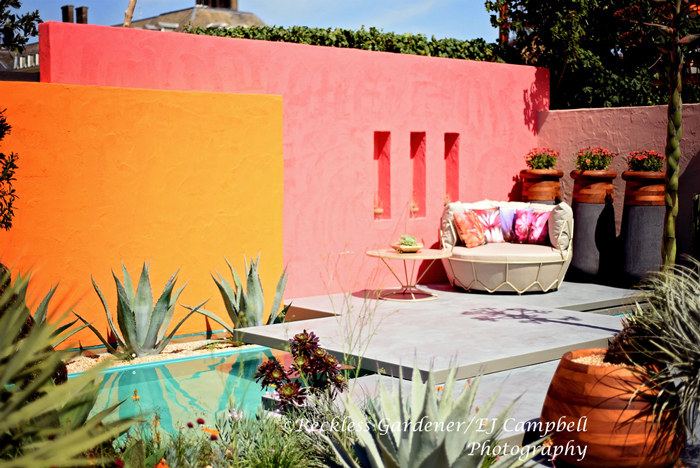 Sarah Eberle can always be counted on for something lively and different and her ‘Viking Cruises Garden of Inspiration‘ (Gold) was no exception, giving us the colour and vibrancy of Barcelona. In an instant there is a change of mood as we progressed onto David Domoney’s moving garden ‘The CWGC Centenary Garden‘ (Silver) for the Commonwealth War Graves Commission. ‘Team Saga: Hagakure – Hidden Leaves‘ (Silver-Gilt) offers us a sacred and peaceful space where friends and family can spend time together. 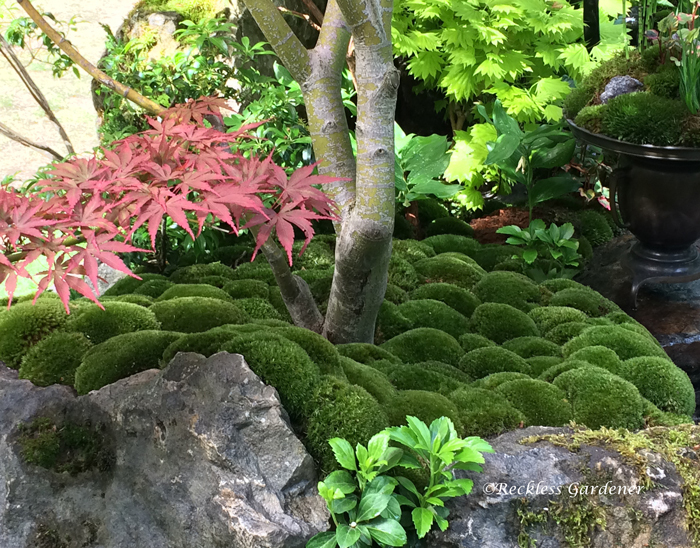 Finally, and now being totally spoilt, ‘Gosho No Niwa‘ (No Wall, No War) (Gold) by the amazing Kazuyuki Ishihara (Gold) wows us with its wonderfully perfect Japanese planting, maples and moss. (pictured below) What more could you want. The style of the Fresh Gardens is always varied and visitors will get a lot of inspiration from the Best in Category: ‘City Living‘ (Gold) designed by Kate Gould with its brilliant ideas for those living in an apartment block. Very clever design ideas by Kate, easily taken away and used not only by city dwellers but urban gardeners as well. I drooled at the colour wash of the walls on Manoj Malde’s ‘Inland Homes: Beneath a Mexican Sky‘ (Silver-Gilt) (above) garden which I am informed has hints of clementine, coral and cappauccino but if you needed something really different in your garden you could go for Jack Dunckey’s ‘The Bermuda Triangle‘ (Bronze) with its laser cut aluminium sheeting and tropical planting. 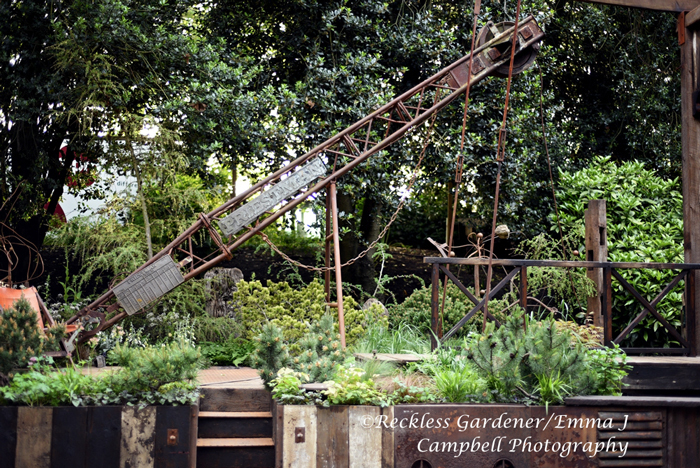 ‘The Breast Cancer Now Garden: Though the Microscope‘ (Silver-Gilt) (above) designed by Ruth Willmott, brings us back to a soothing planting palette designed around three metal, vertical circles representing a scientific microscope lense. The final garden in the Fresh category – Mind Trap sponsored by idverde (Gold) and designed by Ian Price with its strong messages of what it is like to be living with depression. Really pleased for Ian and his team – well deserved. Finally, that leaves the Feel Good Gardens. These were already creating a lot of interest on press day and I feel sure that during the show the public will home in on them like flies to a jam pot! 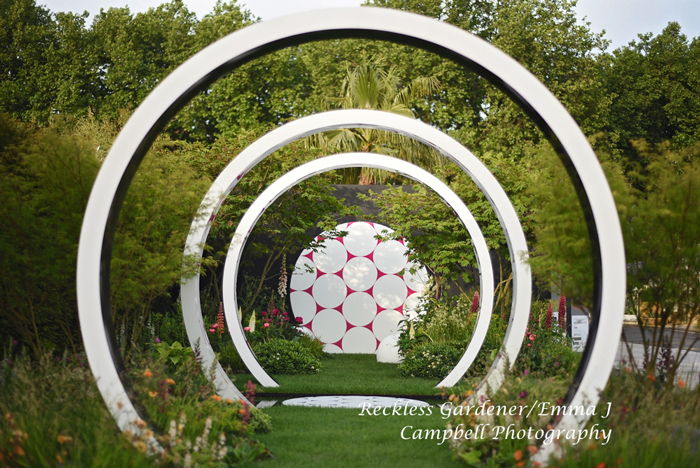 There is plenty to connect with here from The Jeremy Vine Texture Garden designed by Matt Keightley with its geometric forms, domed rock seats and feathery grasses to the amazing planting on Sarah Raven’s garden – The Anneka Rice Colour Cutting Garden. (pictured above) Be prepared to drool! 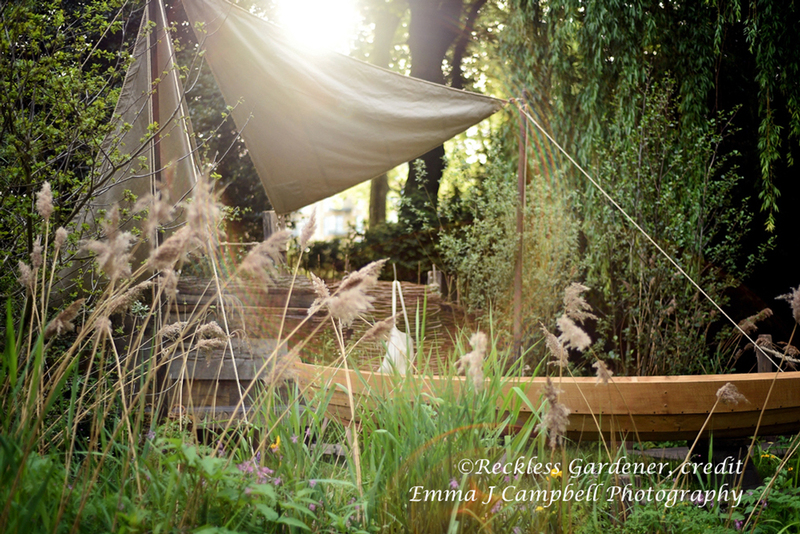 The Zoe Ball Listening Garden designed by James Alexander-Sinclair has three water troughs that vibrate to a pulse. The result is not only totally fascinating but actually quite mesmerizing and I just wish I could have one in my garden. James told me he got the idea from standing next to vibrating sound speakers but the idea of using sound in this way to make water dance is totally awesome. 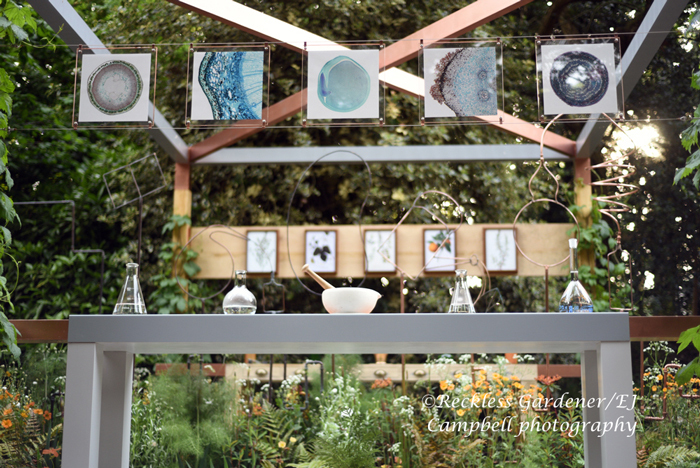 The Jo Whiley Scent Garden designed by Tamara Bridge and Kate Savill is an assault on the senses as it inspires us with all kinds of aromas from the smell of rain on warm paving to the delicious scent of freshly cut flowers. The show going public will enjoy all these gardens and there will be plenty to talk about on the way home and no doubt lots of inspiration for the gardening season to come.